This post is a follow up to the Quarter Quarter Half trips adjustment post. 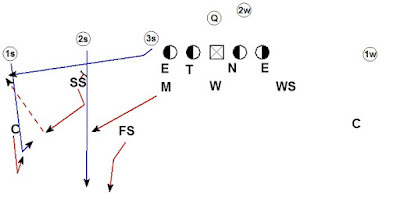 This post focuses on the 1/4 1/4 1/2 coverage vs. some common 3x1 strong side routes. The Corner is reading the QB for quick game. 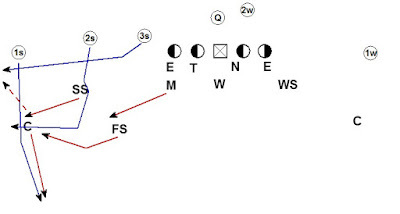 Against a hard shoulder action to the flat the Corner will trigger to #1's quick game route. The SS has #2's quick game and the Mike has #3. The Corner will handle the outside vertical, squeezing the route into the sideline. The SS will handle #2's quick game. The Mike will handle #3's quick game. The Mike will handle #3 on the quick game. 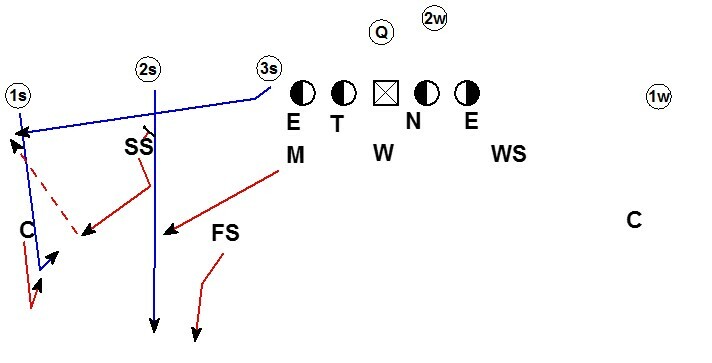 The SS has #2's quick game which is the sit route by #1 on the quick exchange by #1 and #2. The corner will trigger on the QB's hard shoulder to the flat. The goal is to force the long throw to the flat where the corner should make the play. #3 is out so the Corner squeezes to #1 in his quarter. The FS is squeezes #2 in his quarter. The SS collisions #2 until he gets a "Push" call from the Mike. The SS pushes from Seam to Curl and breaks to the flat. The Mike expands looking for work. If #1's stays wide the SS covers both the curl and the flat route. If the curl works inside the Mike covers it. #3 is out so the Corner squeezes to #1 in his quarter. The FS squeezes #2 in his quarter. The SS collisions #2 until he gets a "Push" call from the Mike. The SS pushes from Seam to Curl and breaks to the flat. The Mike expands looking for work, finding the inside curl. The SS must high low the curl to the flat. #3 is out so the Corner squeezes to #1 in his quarter and should expect NO help on the post. The FS squeezes #2 in his quarter. The SS collisions #2 until he gets a "Push" call from the Mike. The SS pushes from Seam to Curl and breaks to the flat. The Mike expands looking for work, finding the inside curl. The SS must high low the curl to the flat. If the FS sees the Mike is expanding to cover the curl the FS can man turn and undercut the post. #3 is vertical so the Corner plays the deep outside 1/3. His vision snaps to the outside receivers to find vertical threats. When #1 breaks his route short the Corner should make a "China" call. The Corner covers #2 on the corner route. 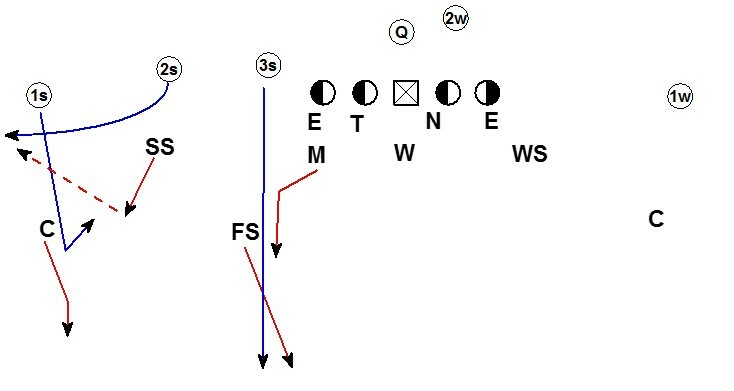 The FS plays the middle 1/3 and squeezes #3's vertical. The SS collisions #2 until he gets a "China" call from the Corner. The SS immediately expands to the flat on a China call. 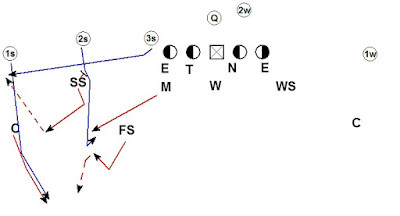 The Mike drops underneath and inside the #3 vertical, collision if possible. #3 is out so the Corner squeezes to #1. 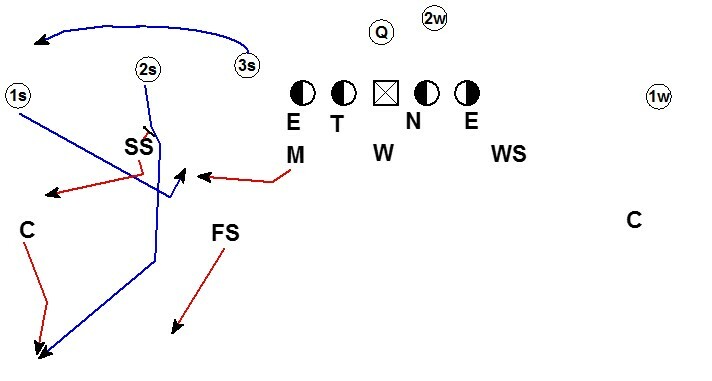 With #1 releasing inside immediately the Corner will zone his quarter and cover #2's corner route. 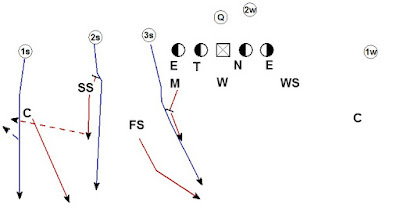 The FS squeezes #2 in his quarter and covers #2's corner route. The SS collisions #2 until he gets a "Push" call from the Mike. The SS pushes from Seam to Curl and breaks to the flat. The Mike will expand looking for work, finding the sit route by #1. #3 is vertical so the Corner plays the deep outside 1/3. His vision snaps to the outside receivers to find vertical threats. With no vertical threat the Corner zones his 1/3. The FS is playing the middle 1/3 and squeezes #3's vertical. The SS tops #2 playing in the window of the curl and breaking late to the flat. 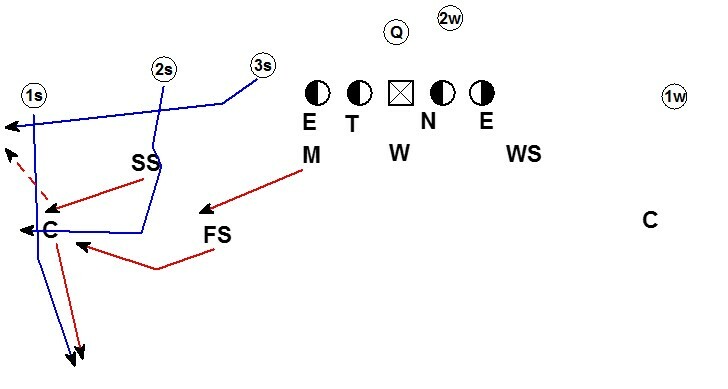 The Mike drops underneath and inside the #3 vertical, collision if possible. #3 is vertical so the Corner plays the deep outside 1/3. His vision snaps to the outside receivers to find vertical threats. With 2 vertical threats the Corner midpoints the 2 verticals favoring the inside vertical. 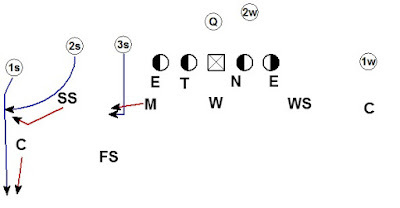 The FS plays the middle 1/3 and squeezes #3's vertical. The SS collisions #2 and gets depth in the seam with his head on a swivel. The SS expands to #1 if #1 converts his vertical to a comeback. 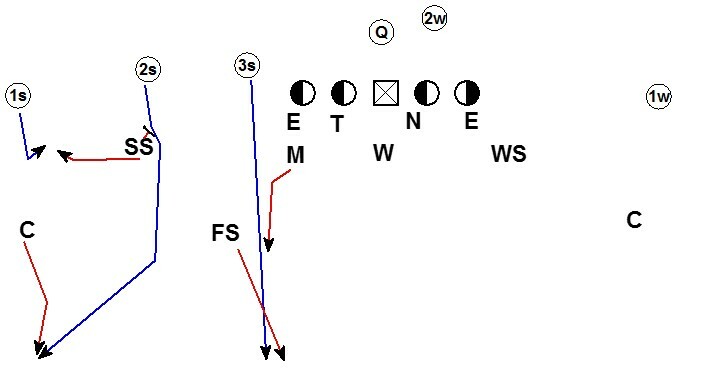 The Mike drops underneath and inside the #3 vertical, collision if possible. #3 is out so the Corner squeezes to #1 in his quarter and should expect NO help on the post. 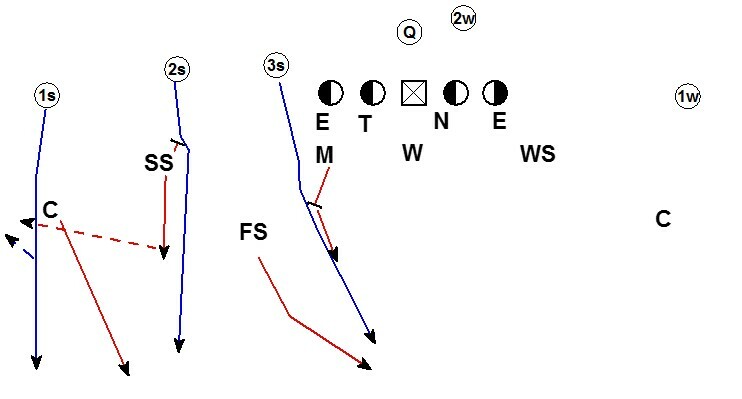 The FS squeezes #2 in his quarter and covers #2's out route. The SS collisions #2 until he gets a "Push" call from the Mike. The SS pushes from Seam to Curl and breaks to the flat. There is no curl but by pushing to the curl area the SS is underneath the out route by #2. The Mike will expand looking for work. #3 is out so the Corner squeezes to #1 in his quarter. Once the corner snaps his eyes to #1 the #1 receiver is blocking. The corner will shed #1's block and secure the sideline. The FS squeezes #2. 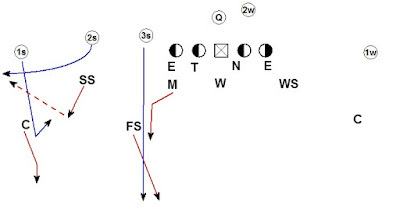 Once the FS snaps his eyes to #2 the #2 is blocking. The FS will run the alley inside the SS. 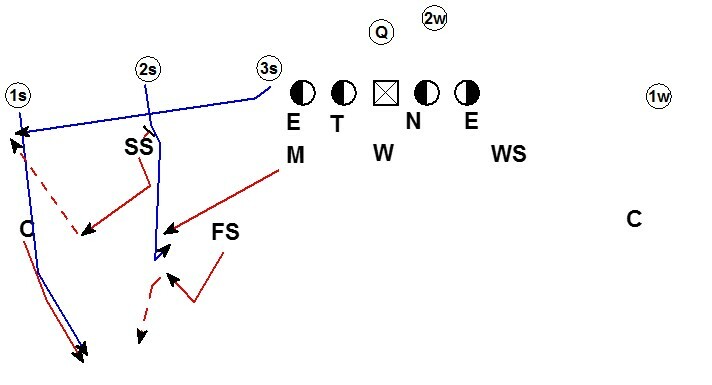 The SS sheds #2's block and will force the bubble with outside in leverage. The Mike will expand inside out caging the ball with the SS. #3 is out so the Corner squeezes to #1 in his quarter. Once the Corner snaps his eyes to #1 the #1 receiver is chopping his feet and selling a block. The Corner may react but by having his eyes on #1 allows him to collision and run with bubble & go. The FS squeezes #2. Once the FS snaps his eyes to #2 the #2 is chopping his feet and selling a block. The FS may react but by having his eyes on #2 allows him to collision and run with the bubble & go. Film study will help the Corner and FS identify the difference between bubble vs. bubble & go. #3 is blocking so the Corner plays the deep outside 1/3. His vision snaps to the outside receivers to find vertical threats. With no vertical threats the Corner triggers to the screen and secures the sideline. The FS triggers and runs the alley inside the SS. The SS triggers straight up the field. If the SS gets any width he will get kicked out by the OL. By triggering straight upfield the SS either makes the tackle by beating the block of the OL or forces the ball to bounce over the top back inside to the rest of the defense. The Mike will expand inside out caging the ball with the SS. #3 is blocking so the Corner plays the deep outside 1/3. His vision snaps to the outside receivers to find vertical threats. Once the Corner snaps his eyes to the outside receivers where #2 is chopping his feet and selling a block. The Corner may react but by having his eyes on the outside receivers allows him to collision and run with screen & go. 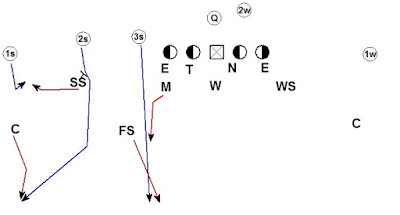 The FS may trigger on #3's "block" but by having his eyes on #3 allows him to collision and run with the screen & go. Film study will help the Corner and FS identify the difference between wide screen vs. screen & go.